Now that the autumn season has kicked in, pumpkin is in the air, sweet scents, and new gardening projects are just around the corner for homeowners. But, for those who want to make the most out of their garden and want it to truly bloom, regardless of weather, there are a few simple things you can do when planting and caring for the garden, to ensure this is the case. Consider some of these tips to make the most out of the garden space, and truly create an area you are going to enjoy for your home. Yes, it is important to know the zone you are gardening and planting in. Not only so you choose plants and trees which can grow there, but also to ensure they can thrive through cooler months, with limited sunshine. Making sure you know what to plant, how to plant, and where to plant it, will allow you to develop an excellent gardening area, and one which will thrive, even during the colder months ahead. Perennials remain dormant, protect roots and bulbs, help keep freezing at bay. Yes, simply adding fresh mulch and properly caring for it when cultivating your autumn garden, will help it thrive. Due to the limited growth, limited water production, and plants which require moisture during this season, mulch is essential for your garden’s success. Add it regularly, properly care for it, and ensure it is evenly spread during these months of the year when planting. With colder weather, you also have to choose the right items to plant. Collards, mustard greens, and darker, leafy greens, are the ones which will typically thrive during the colder months. Root veggies, such as beets, are also a great option for you to add to your garden during this season. Avoid items like tomatoes, fruity or scented veggies, as they can’t survive the colder months or frost which is sure to pop up at some point in time or another during the winter months. If you live in areas where frost and snow are eventually going to show up, make sure you perform proper tilling regularly. Choose mulch and grass which remain dormant and do not grow during the season. Not only so you don’t have root build up, but also to avoid the “dead” growth in the garden. It will also help in preventing the soil which is below the surface from freezing, and potentially killing out the entire harvest you have cultivated during the autumn months when you choose these dormant soils and fertilizers during the season. 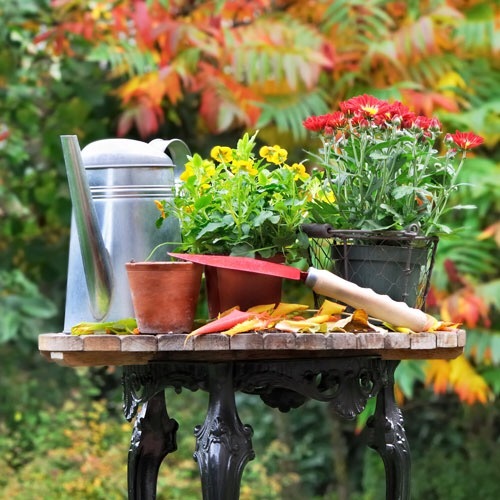 If you are planning on hosting a few friends at your house this autumn then why not make the most of your garden. Garden parties have become quite popular since more and more people have started to buy fire pits for the colder months of the year. Fire pits are great to sit around with your friends and family and toast a few marshmallows. With bonfire night and Halloween approaching a fire pit would be a brilliant addition to your household. If you would like to look at a few fire pits then gardenflame.co.uk is a good place to start. Of course every garden is going to differ a bit, especially depending on the zone where you live and plan to do your planting and gardening in. But, with these things in mind, anyone can have a garden which thrives during the season. These are a few simple tips anyone can follow, which are sure to help your garden thrive, and allow you to enjoy this hobby, even during the colder months of the year to come.